Aside from bottling, chilling the wort has been my lease favorite part of brewing. It just doesn't happen quick enough, and the whole time is stressful, watching it, hoping the ice does it's job, wishing it would cool quicker, hoping not to let the bad stuff in at this critical stage of the process. With the tap water pushing 80 degrees and the Florida heat, it's tough to get the wort to a good pitching temp. Even using every last ice cube from the freezer, it just seems to sit there and slowly cool. I've found for the last several batches that once it hits about 80 degrees, I transfer to the carboy. It just doesn't get any cooler than that. I then set that in the fermentation refrigerator and wait. After several hours it would be cooler and then I pitch the yeast. I've invested in an immersion wort chiller (probably the most common) and it does work. It is simply a very slow process. But why aim for a fast cooling? A quick cool will produce what they call the "cold break" with separates the protieins and allows them to fall to the bottom, helping to result in cleared beer. Those same proteins will produce what is called "chill haze" once the beer is chilled to serving temperature. Not a big deal, but doesn't a nice clear sparkling beer seem so much more inviting? More importantly, the most dangerous time for the beer is between the boil and the start of fermentation activity. After the temp drops below 150ish, microbes and other beer spoilers can live again in the liquid. Part of proper sanitation is to work to avoid opportunities for something to get in the beer. They say the definition of insanity is doing the same thing over and over and expecting different results. This past weekend, I was determined to try something new to help chill the wort faster. I relayed my frustration to Aaron at the Sanford Homebrew Shop. I told him that I've tried prechilling the water, by placing the hose and an extension of tubing in an ice bath so the water inside would cool before hitting the hot wort. He said that several others (including himself) has tried that same method and it simply doesn't save any time. Instead, he said, they've used a pump to recirculate water from an ice bath through the chiller. Get a bucket, fill it with ice and hook up an inflow and outflow, and send ice water through the system. This sounded good, except I don't have a pump, or a big bucket, or necessarily the pieces and parts to create this closed type system. Plus, what about the hot water that leaves the chiller and then goes back to the bath? He assured me that it works well and the ice keeps the overall water nice and cool. Sounds like a viable solution. Perhaps I can figure out something similar. I already have the cooler which I use as the mash ton, and it have a valve which will release water from the bottom of it. I can hook up a 1/2" tube to the output on the tun and into the wort chiller. If I elevate the tun, will the water gravity feed through the entire chiller and out the other end? In fact, it will. Especially it there is a full 5 gallons of water (and ice) in the tun, adding pressure to the flow. I know it's not the best photo. Sorry. Ice ice baby! I purchased a single 20lb bag of ice. 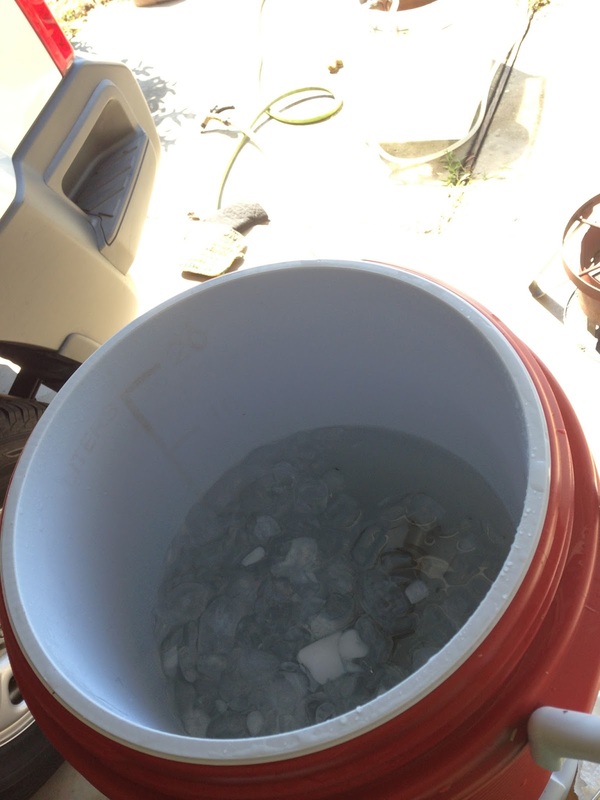 With the tun set up, I filled it with ice (about 2/3 of the bag) and then filled with water and started the flow. As the water level diminished, I simply added more water to the tun through the hose. Cold water into the wort chiller, hot water out the other side. It's working! It's working! I believe that the hot sides of the brew kettle work against cooling, so I have a storage bin that I filled with hose water also and set the kettle in it. If that water gets too hot, I'll change it out with new water. The biggest advantage is sending ice cold water directly through the wort chiller. I timed it, roughly, and got the temp down to 80 degrees in about 12 minutes. And it kept on lowering. Ideally, around 70-75 degrees is good to start transferring. I've done that the slow way and now, knowing that the wort will be cool, I can possibly save time and headache with that transfer as well...but that is another story.